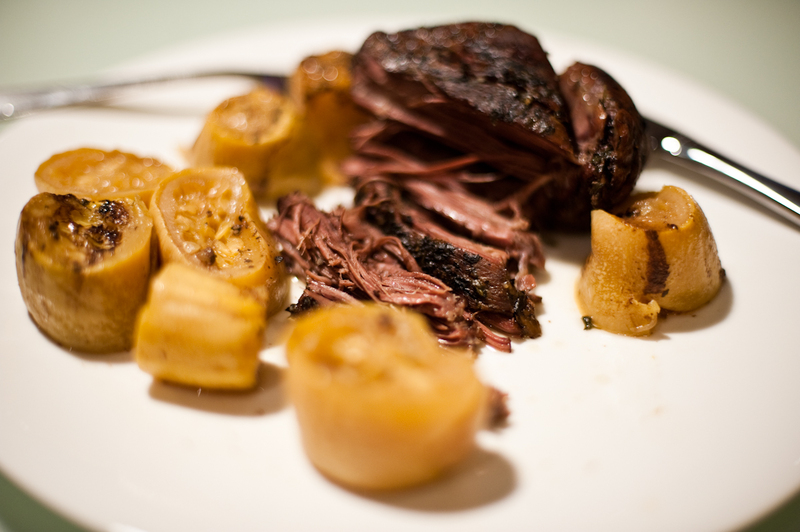 Crock Pot Pot Roast and Squash. So hot, it's steaming! I feel the need to start this recipe post with a disclaimer. I have only used a crock pot 4 times in my entire life. Yep. The secret’s out. And to top it off? Each of those times took place within the last 3 weeks. So, while I am mighty proud of this pot roast recipe, and it’s a newfound favorite in our household, I am sure the crock pot gurus out there might have some suggestions to add. Buy the best beef you can get your hands on! Vary the herbs as you please! Chop veggies of your choice in large chunks and add to the crock pot (pot is turned OFF right now). Chop the ½ Onion into large chunks and throw into the crock pot with the veggies and the 4 whole (peeled) cloves of garlic. Preheat skillet to medium-high. Add cooking grease. Season the Pot Roast on all sides with Parsley, Oregano, Sea Salt, and Cracked Pepper (or whatever spices you like!). Leave the rope around the roast the entire time while cooking. Get generous with the spices, it's a big roast! Once skillet is heated, sear the Roast on each side for about 1 to 1.5 minutes. Sear it on all sides! When seared, place the Pot Roast on top of the veggies inside the crock pot. Add 1/2 cup water. Crock Pot is OFF until everything is inside and ready to go! Put the lid on, plug it in, and start cooking! We cooked a 3.2 lb. Grass-Feed Pot Roast for 7 hours on low, and it was plenty done but still tender. 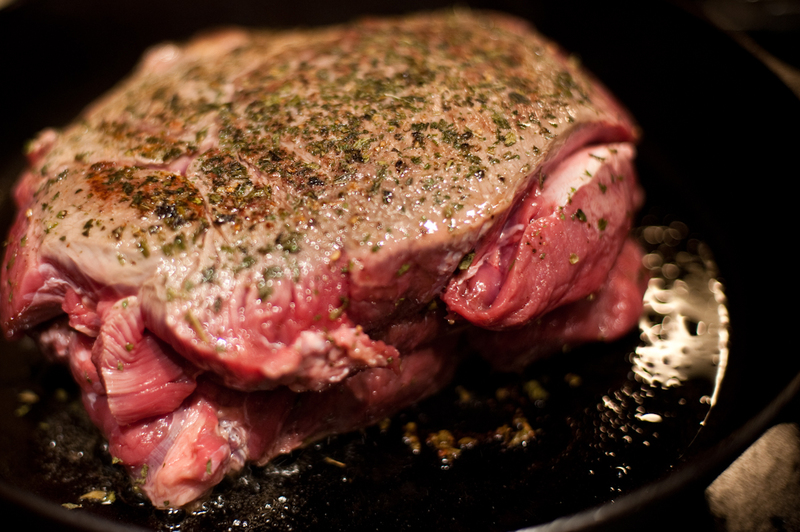 Cooking times may vary based on high or low settings, size of the Pot Roast, as well as if it is Grass-Fed or not. 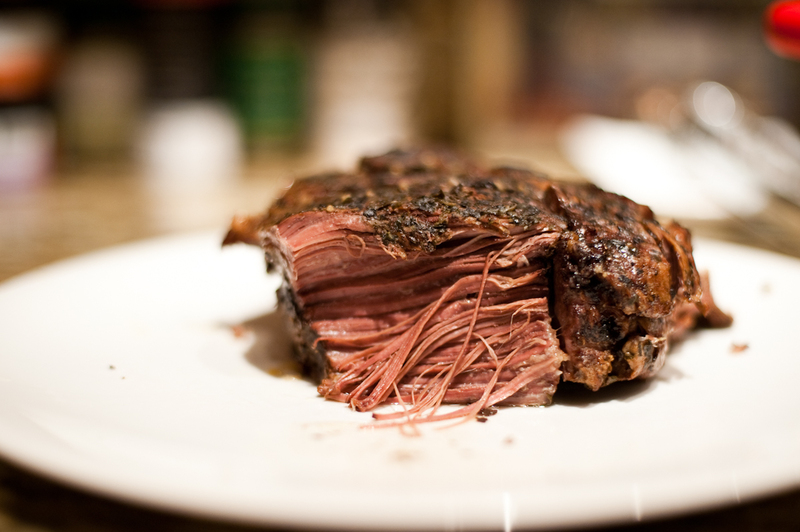 Grass-Fed beef tends to cook faster than non-Grass-Fed beef. 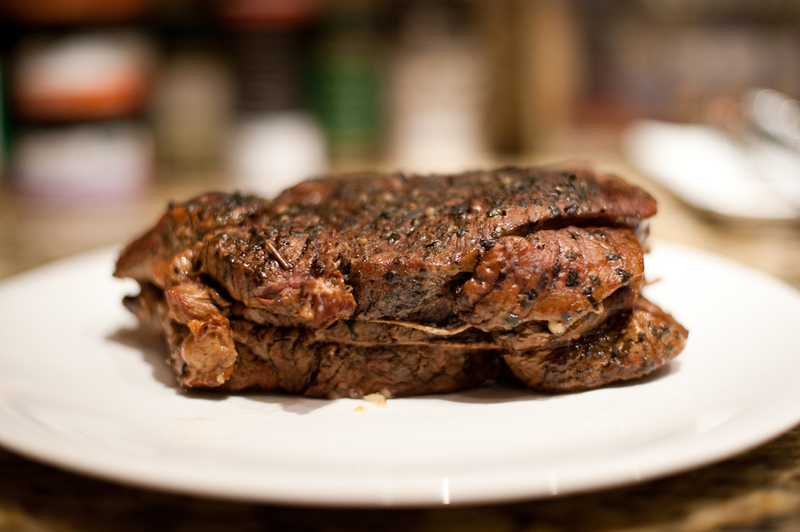 We always recommend Grass-Fed for highest nutritional value! Our view at the end of 7 hours on low. Mmmm.... Smelled SO good! Use a fork to pull your piece off and plate it! It literally just falls apart. Cover with juices from the pot for extra flavor. Finish with a touch of Sea Salt if desired, and enjoy! 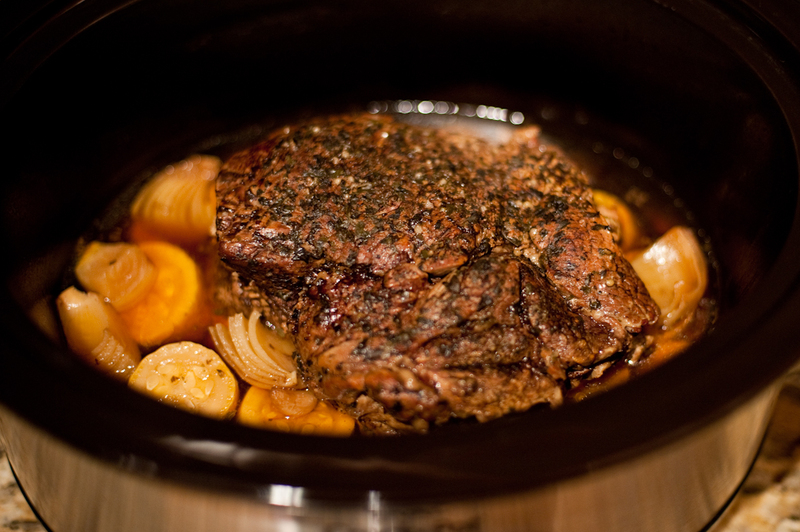 Click here for a printable recipe for Crock Pot Pot Roast! 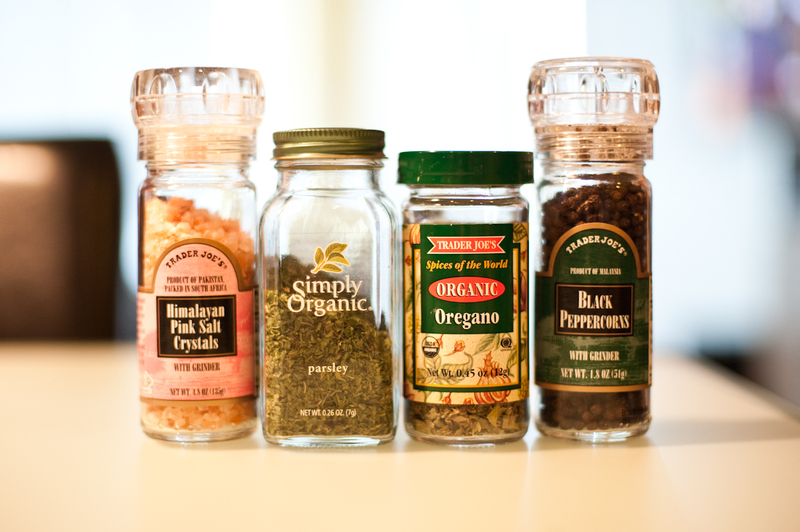 I just love using beautifully packaged things like those Simply Organic spices. Definitely one of my favorite things. I have one recipe for my Crockpot, french dip sandwiches. I definitely need more. 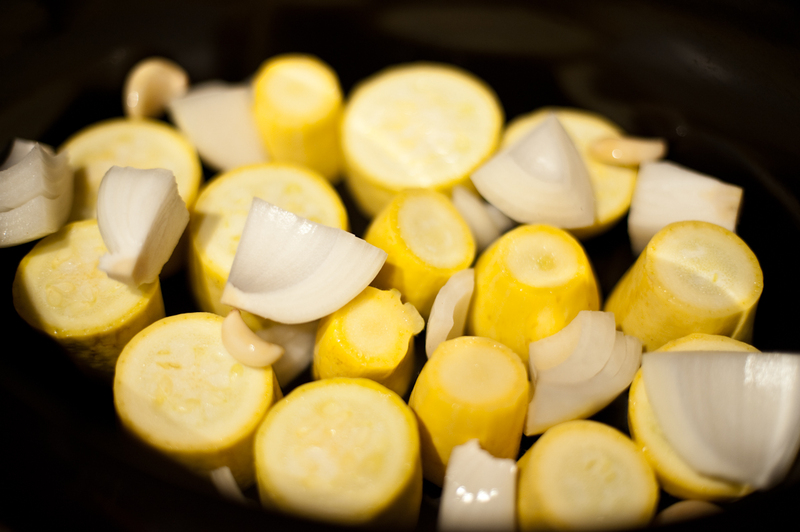 I have never used squash in the crockpot before, I am going to give that a try! Dry Onion Soup mix is also a great thing to use for seasoning, and using chicken broth and a little red wine for the liquid instead of water can also add some great flavor! Great ideas Amy! Thanks! My only problem with the dry onion soup mix is that I haven’t yet found one that doesn’t contain corn starch and other unnecessary gunk. I actually just think I may have found a great scratch recipe for it that might pass the test. I’ll have to try it out next. Love the chicken broth idea! I’ve gone vegetarian again but I love reading your blog! I’m a wuss when it comes to cold weather. This looks like it will warm my body and soul! Definitely earns an OM NOM NOM! I always hate archiving your email/RSS from my inbox because of your as-always-and-beautiful photos. You have a gift that makes the food almost edible from how well you capture them. Great post! Wow, this looks incredibly good! Seems to be the perfect dish for the cold season! I’ve made crock pot roast several times in the past using the onion soup mix and can of thick mushroom soup and it never failed me. I made your version and I was disappointed with the flavor. I nixed the squash and added potatoes and carrots, but followed the recipe as you posted. I wonder why it tasted so “off”? Did anyone else experience this? Maybe the herbs were not the best choice. Beautiful photos, by the way. And I LOVE your blog. Keep up the good work. Hey Nature Girl, Thanks for your comments. I, too, agree that one might be disappointed with this after using the soup mixes! This is a very basic recipe. I have had the onion soup mix version of pot roast, and it definitely has a lot more zest. My concern with the soup mixes is the other gunk that comes with them, such as corn starch or syrup, soybean oil, xanthan gum… aka stuff I don’t want in my body. Maybe you know of a good one that’s also all paleo? I’m excited though, as I just bought ingredients the other day to try and replicate the onion soup recipe, minus all the chemicals. 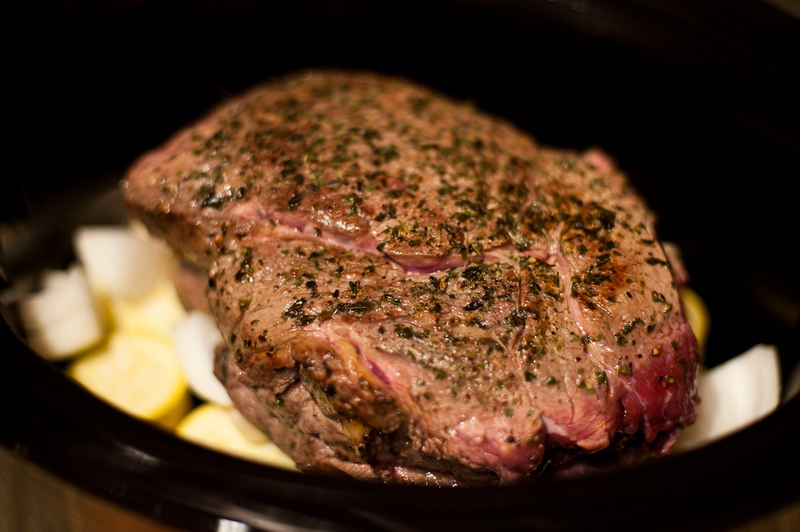 I’ve got a chuck roast waiting in the fridge and I’ll be sure to post the recipe if it’s a success! yum, looks great! 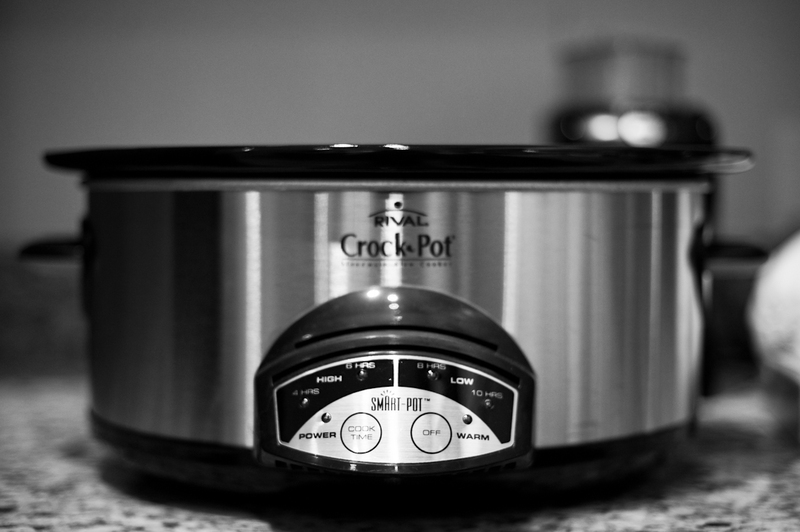 crock pots ARE awesome. I made a great chicken tikka masala in mine last week. Easy Peasy. p.s. your blog is great! I’m a fairly new convert to Paleo and I’m both excited & overwhelmed. ;o) Your site is awesome and very helpful! 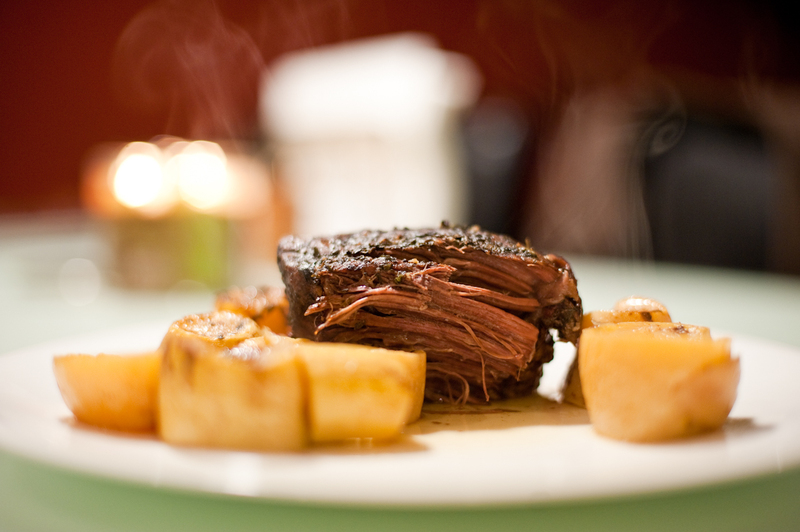 LOVE the pot roast entry…going to make this for Sunday dinner!! We had kids sports all day so I threw everything together bright and early this morning. Even chopped all the veggies last night. So nice to come home from a rainy football game to this yummy pot roast. I used carrots and parsnips instead of squash. The parsnips were a great substitution for potatoes and totally paleo. One of my new favorites! I love all of the pictures you include. They are beautiful. Thanks for all of the wonderful recipes! Hello! I am brand new to paleo and am looking for new recipes. This pot roast looks delicious! 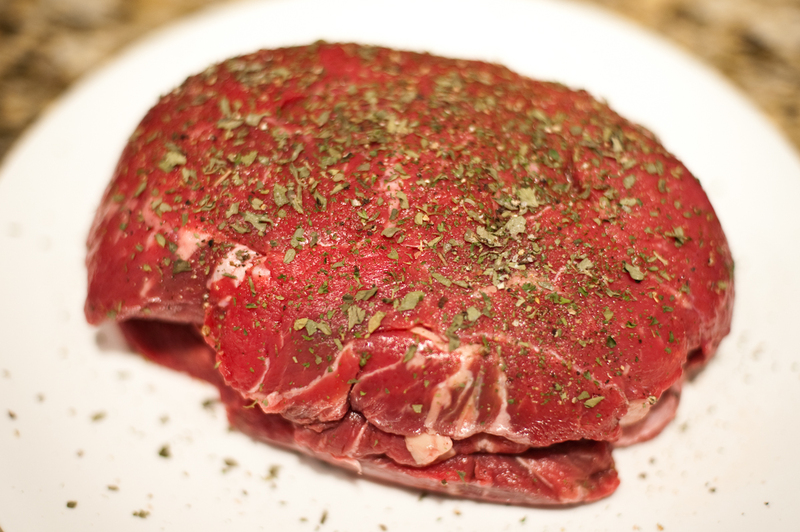 Do you know if most chain grocery stores carry grass fed beef? What is the cost difference between it and regular beef? Thanks for your help!! From what I’ve seen, most chain stores are not carrying grass-fed beef. We get ours from our Butcher, or our local PCC or Whole Foods. They all get their grass-fed beef locally when they can. Check this post (http://paleogirls.com/2010/11/16/wheres-the-beef/) for some resources for you locally. Grass-fed beef is so much healthier for you to eat than feed-lot or “organic” beef. I highly recommend that you watch Food, Inc. for the full story. There’s a great website that can help you find grass fed beef locally. For some you have to buy 1/2 or 1/4 of a cow, but some of them sell it by the cut. eatwild.com Trader Joe’s also sells grass fed beef if you have some near you. Made this for dinner tonight using your “onion soup recipe.” It was delicious. I used a 2.5 lb roast. I cooked it on low for 5 hrs in the crock pot. May have been a little long…but it was still really good!! I used yellow squash, zucchini, onion, and carrot to line the bottom- cut in big chunks as suggested. This was a perfect meal to come home to after work for the entire family! Thanks! Yay! That made me happy to read :) Nothing smells better than a house full of pot roast! Thanks for sharing! Hi there! Just started reading your blog since my boyfriend got me into the Paleo way of life. Tried this recipe today and it came out fantastic! I added brocolli, zucchini, squash as well and used “vino seco” (dry white wine) and water. The smell and flavor was just incredible. thanks for the recipe and guidance! Were you successful replicating the onion soup mix? I love to add that to my pot roast, too. 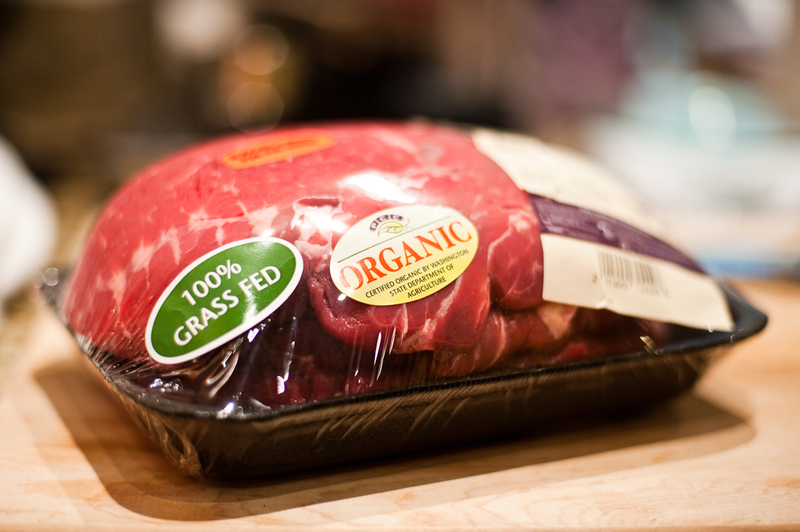 We just bought our first grass fed roast to make in the crock pot.